In this blog post, i would be showing you a cool way using which you can generate a network map of your entire vmware infrastructure, it basically involves using powercli in conjunction with visio api calls to automatically generate a network diagram of your virtual infrastructure. The script below needs a connectivity to a vCenter server, once established it would iterate across all the clusters in your environment and generate a visio for it and save it to a predefined destination location. 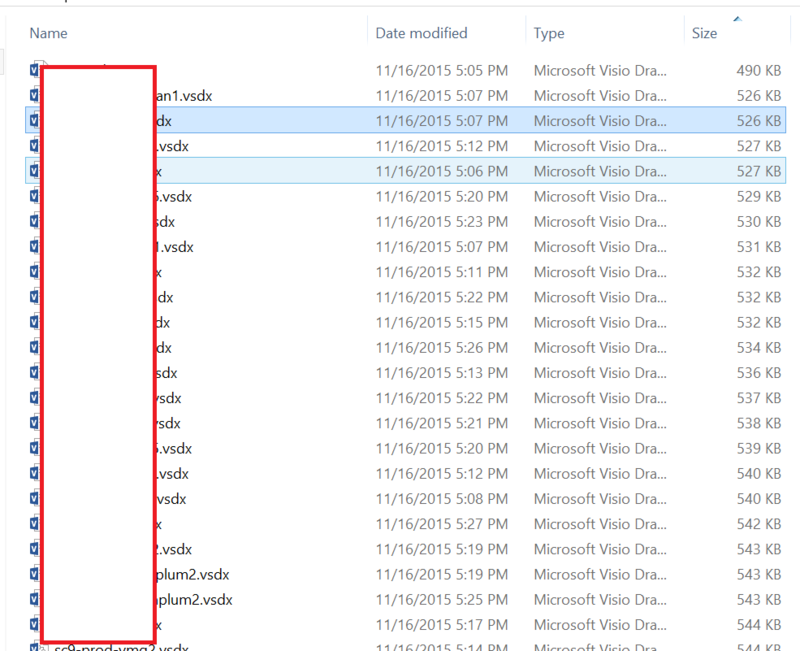 You would need to download the VMware EUC Visio Stencils 2015.vss stencils and save it in your visio shapes library. In my setup i saved it in the “My Shapes” location as shown below in the screen capture. Also note the script was tested in Visio 2013 and it worked flawless in generating the visio file. 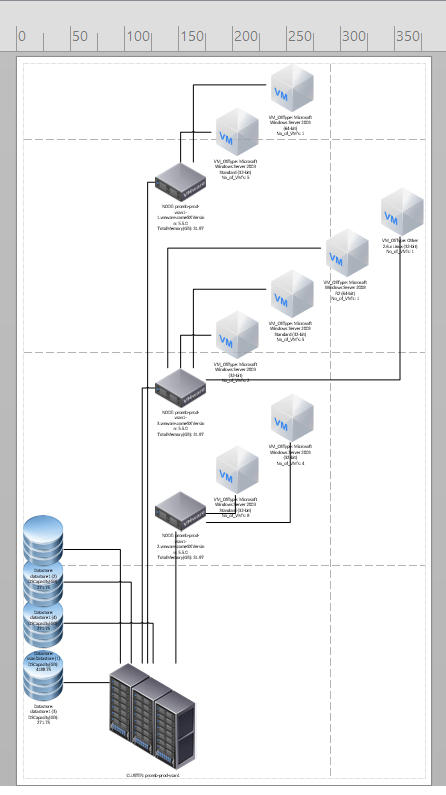 Let me show a sample of how the Final completed Visio generated look’s like. Next let me walk you through the script itself. Next part of the script explanation is highlighted in the comments itself, so lets see its inner working. You can save it and reuse the code as per your environment, feel free to modify and add more content as the possibilities for this logic is endless. $shpFile1 = "VMware EUC Visio Stencils 2015.vss"
$stnPath = [system.Environment]::GetFolderPath('MyDocuments') + "\My Shapes\"
I hope you found this blogpost on generating Visio using PowerCLI useful and hope it helps you out! When I try to run this against my ESX 6.0 cluster I’m getting the below errors. exists and can be set. You need to run this from a machine that has Visio installed. Otherwise it won’t work. I know that the Get-Datastore should work, however it is not working in this case, any suggestions?? Can you make sure you have the latest version of powercli ? I upgraded my powerCLI from 5.1 to 5.5 Release 1 and the issue still persists, I don’t think its the powerCLI version, I think its somehow the way the script is executing and not able to store the output of Get-Datastore into the variable which is causing this issue. were you able to execute this in your environment without any issues? I still get the same error with Get-Datastore and everything else executes fine in the visio diagram. Yep, I can run just the command Get-Datastore in powercli and its working fine, its showing me all the datastores connected to the datacenter. I’m getting the same errors as Pradeep. I have PowerCLI 5.5 Release1. Running ‘Get-Datastores’ on its own, works fine. Any follow ups on this one. Good one, how can I get IP address for each VM. I realize this post is somewhat dated now but it appears to still be an incredibly useful script with a few adjustments. The problem is that $pagObj is being called inside a function when it hasn’t been passed, thus the $null object errors. Try adding $pagObj as a parameter in the two functions and then passing it as a tertiary param when they are called later in the script. I see this script may save my time and effort on preparing VMware Infrastructure Diagram, but unfortunately I received following messages on my PowerShell ISE when I run the script. I figured it out and errors mitigated. Is there a way to Integrate network portion in this script? How did you fix it? I am getting same error? I know this is an old thread, but can you post what you did to resolve these errors? I’m getting the same issues and im not well versed in powershell enough to figure out whats happening. Missing statement body in foreach loop. One question, how can I have this script write name of the VM? It does print names of datastores and hosts etc. Cool script, I had no issue of plotting the drawing. My print out is so small, How do i make the drawing to fit into a page?